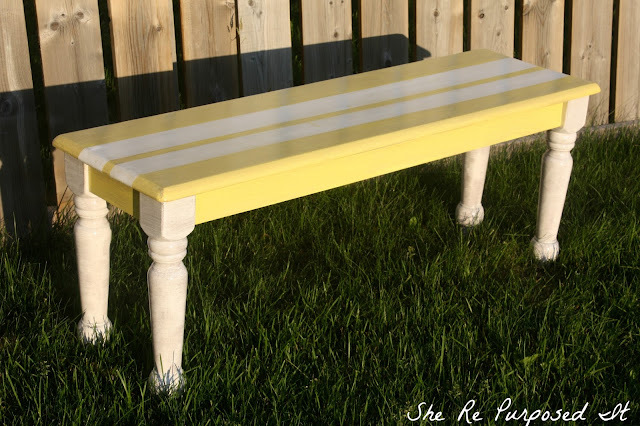 A wonderful customer of mine offered me this bench! It needed work but what doesn't right? They had tried staining it and then painting it but neither of those gave them the look they wanted. So instead of tossing it she thought of me, I'm so glad she did! 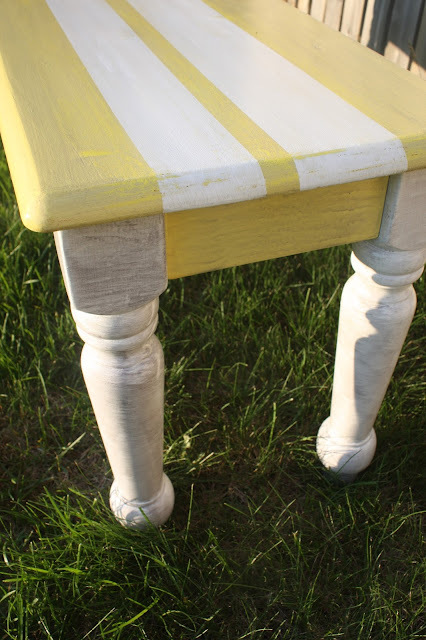 The paint was chipping in some areas and my idea was to strip off the paint and stain it! Well...long story short that wasn't going to happen! I stripped it around 3 times and then began to sand it only to find out the wood grain just wasn't what I had hoped for. This picture is in the middle of one stripping process. So I opted to paint it out in a soft yellow and then cover that with a grey wash technique. 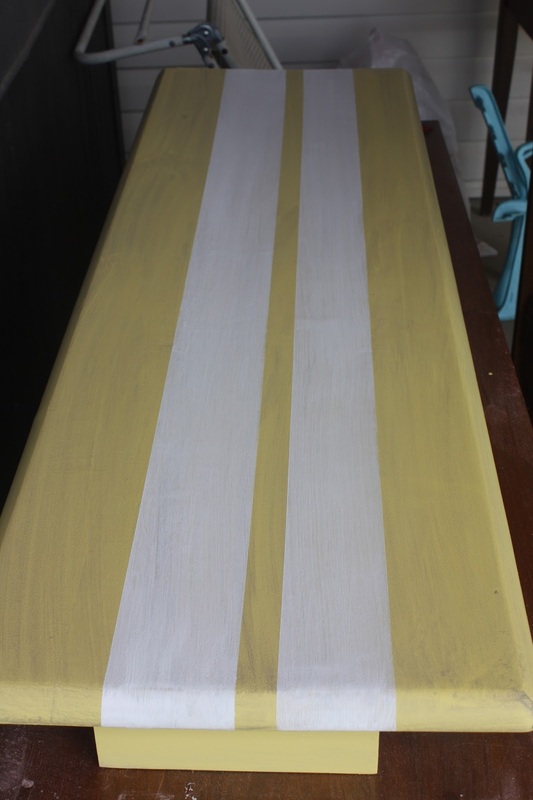 Once that was dry I taped off some stripes and filled them in with a white. The legs got a coat of white as well and then the same grey wash technique. 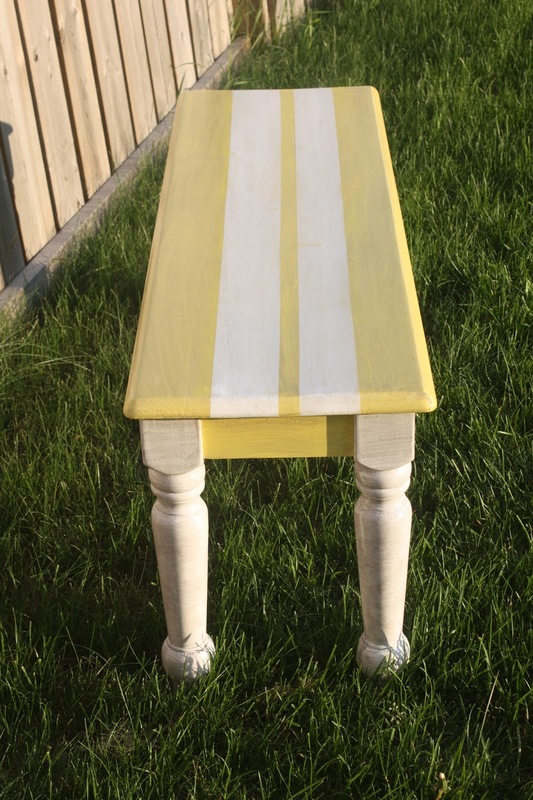 Once the entire piece was dry it got a full coat of poly to make sure this beauty is durable. I can see this in so many wonderful places: an outdoor garden, at the foot of a bed, at a breakfast table! I think she would be perfect just about anywhere. Meet Lemonade! Isn't she purrrdy! Thanks again Natasha for allowing me to save this beautiful piece of furniture!